Manipur Governor Dr Najma Heptulla on Wednesday stressed on the importance of conserving energy as it is fast depleting and said its conservation is the only way which helps in maintaining the non-renewable resources of energy apart from replacing the use of non-renewable energy with the renewable energy. Governor Dr Heptulla was speaking at the opening function of the State Level Painting Competition, 2018 organized by Loktak Power Station of NHPC Ltd as part of National Awareness Campaign on Energy Conservation under the initiative of Bureau of Energy Efficiency, Ministry of Power at Raj Bhavan on Wednesday. She further stated that organizing such competitions among the students will certainly have a good impact in the minds of young students. 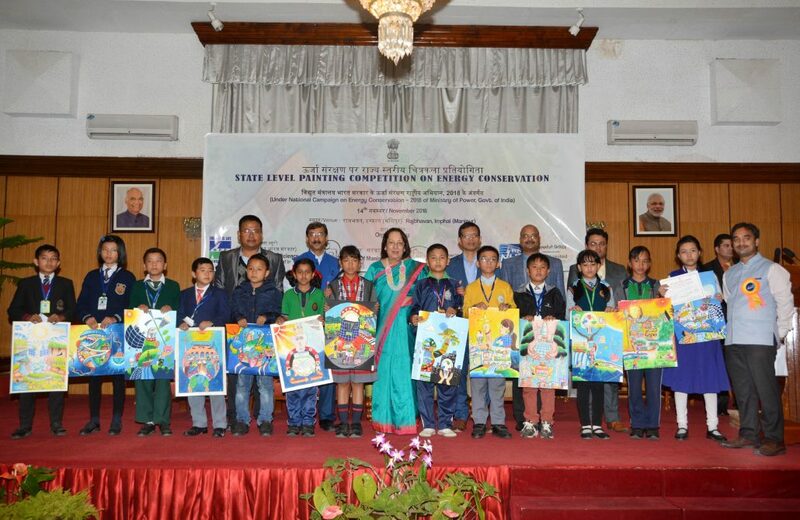 Therefore, to inculcate thought on energy efficiency among school children, Ministry of Power has taken this initiative of organizing painting competition on Energy Conservation for the students since 2005. The awareness campaign will not only make the students conscious about the need of conserving energy but will educate and also involve their parents for the cause, the Governor felt. According to reports, India will cross Japan as the world’s third largest oil user this year and is expected to have the highest rate of growth of crude demand globally through 2040. This will have a telling effect on the economy and development of the country as there is a limit to the availability of conventional sources of energy. This kind of awareness campaign will bring better understanding on the subject and help in nurturing the innovative ideas to make India an energy sufficient nation on the global map, she added. The painting competition which was participated by 49 students in Group – A and another 49 students in Group – B was organized under the two different themes – ‘Use Energy Sensibly, Save Money and live life healthily/ Be a bright spark, lights off till it’s dark” and ‘Let us change tradition to achieve energy conservation/ Lightened more cities and villages with energy efficiency’. Director Th Kiran Kumar Singh of Education (S), in-charge Chief Engineer, Amitabh Srivastava of Loktak Power Station along with officials of NHPCL and parents of the students were also present on the occasion.